The policy and management of the Society is directed by a Council and is currently supported by an Honorary Treasurer, a part time Administrator and a Development Officer who manages our Grow & Learn project. The Council is made up of a President, Vice Presidents and elected members. Education, Show, Programme, Publications, and a Strategic Group that is overseeing the development programme. The Council usually meets four or five times a year. George started his Horticultural career straight from school when he took the post of gardeners boy at Smeaton Gardens near East Linton. From there a progression through College in Edinburgh lead to a period of work in the Clyde Valley at Garrion Farm where Messrs J Warnock and Son grew a wide range of vegetables fruit and tomatoes. George joined the student course at the Royal Botanic Garden Edinburgh in 1966 and, after completing his three-year diploma course, joined the staff as a Botanical foreman. Progression through the ranks and some good luck saw him remain at the Botanics until 2004 when he retired from his post as Head of the School of Horticulture. On retiral he became a member of Council of the RHS, President of The Royal Caledonian Horticultural Society and was invited to become a presenter on BBC Scotland’s Beechgrove Garden, which he still enjoys. His hobbies include walking, gardening and allotmenteering, game shooting, fishing, birdwatching and travel. Curator Living Collection, Royal Botanic Garden Edinburgh [RBGE]. Previously Curator of Dawyck Botanic Garden, near Peebles, and Garden Supervisor at Logan Botanic Garden, Head Gardener Castle Kennedy Gardens, Assistant Head Gardener National Trust for Scotland’s [NTS] Brodick Castle Garden, Isle of Arran spent a year at Longwood Gardens, Pennsylvania. Studied at Threave Gardens [NTS], and the Royal Botanic Garden Edinburgh and started his career at Branklyn Garden [NTS] Perth. Jasmin has an Honours Degree in design and lots of experience of working different aspects of horticulture. After obtaining her degree, she spent 3 years working as a gardener at RBG Kew, 2 years working for Conservation Volunteers with school kids, obtained a London University certificate in Ecology and Conservation, and was part of the Gardens and Designed Landscapes panel for the National Trust for Scotland. She is a partner in ‘Landmarkers’, the company that she and her brother Doug set up over 30 years ago. Their work is to design, build and plant gardens and landscapes, mainly using natural stone, water and relevant and exciting planting. They have a team of 7 and have won various awards including 3 Gold medals at Gardening Scotland. She currently represents the Caley in the planning of our new HQ at Saughton, and has worked with the landscape architects on their planting schemes. A passionate gardener even as a child Billy, Billy set up Binny Plants in the former kitchen garden of the Binny Estate in Ecclesmachan, West Lothian in the mid 90s after returning home to Scotland. Inspired initially by Michael Wickenden and self taught, the nursery has grown over the years and is now highly regarded for the range of plants and service provided by an equally enthusiastic and knowledgeable team of plants people. Foremost amongst Billy’s passions are Paeonies and he is on the Trials Committee for the Peony Trials at Wisley Gardens. Robert studied Horticulture at Auchincruive, gaining an HND with Distinction. Keen to practice his skills, he worked as a gardener at Aberdeen’s Duthie Park during a multi-million pound regeneration project. In 2013, he joined the Commonwealth War Graves Commission where he is now Regional Operations Co-ordinator covering Scotland, Iceland and the Faroe Islands. Robert is also a judge for Legion Scotland’s Best Kept War Memorial competition, and enjoys spending time at home tending his own garden when family life allows. Rona joined the Caley in early 2017, keen to use her early retirement to learn more about horticulture and be actively involved in her community. With a background in IT program management, she is also a keen amateur gardener, continually working to tame her overly mature garden and grow more vegetables. Rona is also actively involved in the Saughton Park redevelopment project as Secretary of the Friends of Saughton Park. Alison has been a member of the Caley for a very long time. On retiring from her IT lectureship in Architecture and Landscape Architecture at Edinburgh College of Art, she became Caley Secretary to George Anderson, then Pam Whittle as Presidents. A keen but ignorant gardener, she joined the Caley to improve her knowledge, and before her knees gave out, was one of the Allotmenteers at Bridgend. Her own garden in Morningside was an overgrown jungle ten years ago, but now her greenhouse supplies the family with tomatoes and cucumbers over the summer, along with plentiful soft and top fruit. There are flowers all year. A lifelong gardening enthusiast. Karen created and cared for several gardens before working as part of the behind the scenes gardening team at the Beechgrove Garden. In 2007 after being selected as a finalist in the first Avant Garden Festival at New Hopetoun Gardens she started designing gardens for private clients while still working part-time with the Beechgrove Garden. In 2009, after a period designing for private clients and working at Beechgrove, Karen moved from Aberdeen to Edinburgh to take a Master of Landscape Architecture at Edinburgh University. Now based in Edinburgh Karen splits her time between running her landscape design practice, designing and project managing community gardens and leading volunteer groups that work in and care for the Maggie’s Cancer Caring centres in Edinburgh and Glasgow. Colin childhood ambition was to be a gardener and I think we can say that he fulfilled that ambition. Since completing his formal horticultural education, he has worked in a variety of environments, both in the UK and abroad. He currently works for NTS as one of four Gardens Managers, based at Newhailes Estate. He oversees the management of gardens throughout East and Central Scotland. Besides horticulture, Colin has an interest in photography and hillwalking as well as, the somewhat more unusual, buses and public transport. Ann Burns is Team Leader for Horticulture and Landscape Construction at Oatridge Campus SRUC where she has taught for the past 30 years. 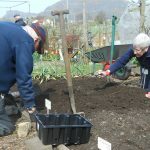 Her lifelong passion is to get others interested in gardening and growing and Ann works closely with Gardening Scotland, the National Gardening Show and the Scottish Gardeners Forum to promote gardening for all ages and abilities. After cleaning her grubby fingernails, Ann may be found with a glass of red wine and a good book at the bottom of her own garden. Kate joined The Caley in 2017, and has become involved as a verifier in the Grow and Learn programme. Having trained in horticulture at RBGE, Kate has worked in a number of historic and botanic gardens in Scotland including; Cruickshank Botanic Garden, Leith Hall and RBGE rock and woodland garden. Kate now has her hands full as the Head Gardener at The Japanese Garden at Cowden, a restoration of an early 20th century garden, just outside Dollar. Appointed as the first Garden Guide at RBGE in July 1991. She officially ‘retired’ in 1997, however Sally is still guiding, as part of a team, so has now been a guide for 26 years. She has also been a volunteer in the Press Office at RBGE for about the same length of time. She has given over 100 talks on the work and history of RBGE. In 2006, Sally was awarded an MBE for services to RBGE. Sally is a former Caley Council member and has served as a Vice-President. She leads our garden tours and arranges our winter talks programme, managing to give us new and interesting speakers each year. She was awarded the Andrew Duncan Medal by the Caley in 2011. In her spare time(!) Sally is the Chairperson of Currie Day Centre, a small charity that provides a weekly service to local older, frail or socially isolated folk. She is also a keen gardener and theatre-goer. Stan grew up in North Berwick where he learned practical horticulture from his father, a professional gardener, before a career in education. A former secretary of the Scottish Begonia Society he now concentrates on alpines. He edits the journal Scottish Birds, while his spare time studies of local song birds led to a doctorate from Edinburgh University. He chairs the Aberlady Bay Nature Reserve committee. He is active in several local gardening clubs as well as North Berwick in Bloom, is a judge for Beautiful Scotland and a recipient of an RHS community champion award. Jean has been The Caley’s Grow and Learn Development Officer since 2014. She was previously Head Gardener and Gardens Manager at The Hidden Gardens, Glasgow, Trellis and FCFCG fieldworker. Before the horticulture ‘light bulb’ moment, Jean was a senior graphic designer for Renfrewshire Council. She is passionate about the benefits of gardening for all and inclusion for all. Julie has a keen interest in anything horticultural and has an honours degree in Horticulture with Plantsmanship which she studied at SRUC and RBGE. She is also a qualified florist. Working part-time, she is the initial point of contact for the Caley. 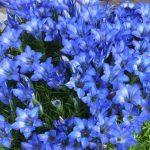 She is always happy to receive material such as event news, plant sales, interesting photographs etc for inclusion on the website and in the monthly e- newsletter. Pam is a very keen amateur gardener who is passionate about the benefits of gardening, in particular to health and well-being. She currently co-ordinates the Caley Spring Show and represents the Caley on the Saughton Management Board.